Taste test: I'm not a big fan of parmesan and garlic generally, so these chips didn't really cause me to want to eat the whole bag. The thick cut Tim's chips, though, help save this bag just a bit, as they are crunchy and as good as ever. It's just that when you add the parmesan and garlic, it feels like you're eating a lot of breadsticks, and the taste doesn't work for me. 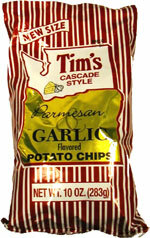 Still, there's a good balance on the powder, so if you like these kind of chips you can't go wrong with Tim's. 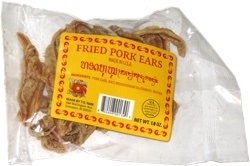 Smell test: A definite garlic aroma, it will remind you of the inside of a pizza parlor (or Vinny Testa's).